For the use with COSMO-RS type models like e.g. COSMO-RS, COSMO-SAC and COSMO-RS(Ol), a large data bank with the required σ profiles (Version 2011 - 4,092 components) has been prepared. Currently 600 to 800 new profiles are added each year. As the quantumchemical calculations become very demanding for large molecules, group contribution methods have been developed to predict σ profiles. These complimentary methods are delivered with DDBSP-Artist and lead to reliable results for not too complex or multifunctional structures. After careful analysis of the results from different modern DFT functionals (BP, B3LYP) with different basis sets and of different commercial products (DMOL3, Turbomole, Gaussian) it was decided to use the software package Gaussian 03 with the basis set 6-311G(d,p) as this provided the lowest overall deviation and the most reliable results (less large deviations from experimental data). Unluckily calculation times are much longer for this hybrid functional compared to the BP functional that can be accelerated by the RI-method by a factor of 10-20.
σ profiles from DDB-Sigma can be used within the DDBSP software (DDBSP Mixture Predict Add-On) and in most third party software (in COSMOTherm® a specially optimized parametrization for these profiles is available). A brief description of the theoretical basis of COSMO-RS type models is given below. For more detailed information, please consult the literature given at the bottom of the page. As a possible alternative to claasical predictive methods based on the group contribution approach, COSMO-RS type models originally developed by A. Klamt have attracted some interest in the recent years. The model uses the results of a so called COSMO (COnductor-like Screening MOdel)-calculation, in which a molecular shaped cavity is constructed around the molecule and a large number of Coulomb charges are placed on this surface. The individual charges and the structure and charge distribution of the molecule are now optimized to find the minimum energy of the system. This can be achieved by different empirical, semiempirical or ab-initio methods. 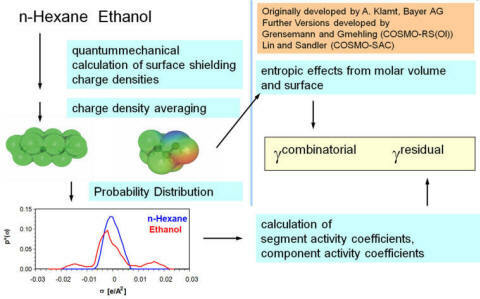 COSMO therefore allows to approximately calculate the electrostatic interaction of a molecule with a solvent. In most cases, quantumchemical DFT methods are employed as these currently represent a good compromise between computational effort and reliability of the result. In case of flexible molecules or components with different tautomeric forms, the calculation needs to be repeated for different conformers and/or tautomers. In order to be used for COSMO-RS type models, an infinite dielectric constant is used to approximate the solvation of the molecule in an ideal conductor. From the optimized charges on the molecular cavity, a list of charged surface segments can be generated. As the shielding charge density (SCD) on the molecular surface generated by this procedure is rather detailed but contacting molecules are only able to "feel" the mean SCD difference over the whole contact area, some averaging of the SCD is required. Based on this information, the electrostatic misfit energy can now be calculated for each possible contact between two molecules in a COSMO-RS (COSMO for Real Solvents) calculation by a simple formula. An empirical terms has been added to account for hydrogen bonding. As the shielding charges are now replaced by the space-distributed charges of the two molecules, both molecules should in principal change their conformation and charge distribution but this effect is neglected to simplify the procedure. Instead of calculating all different mutual contacts of the three-dimensional representations of the molecules, a further simplification is introduced. From the SCD values on the molecular surface, a SCD distribution is calculated that represents the probability to find a certain SCD on the cavity surface. In practical implementations, the SCD distribution or σ profile is mostly represented by the probability values or surface areas for a number of discrete SCD intervals (e.g. 50 or 80 intervals). In this step, all structural information (relative position of the segments towards each other) is lost. In UNIFAC or mod. UNIFAC, the groups represent unique entities with specific chemical behavior while in COSMO-RS, the molecule is broken down into segments which only differ by their SCD. UNIFAC and mod. UNIFAC require regressed interaction parameters between the groups while in case of COSMO-RS, empirically modified electrostatic interactions and a hydrogen bonding contribution are used. While this allows to calculate the real mixture behavior based on the sigma profiles of the components only, there is also a serious disadvantage. In contrast to the group contribution methods it is not easily possible to "train" the method by adjusting a larger number of parameters to the large amount of readily available information. The model thus has to rely on the asumption that the complex behavior of liquid mixtures can be calculated from only a few simple and universal equations and empirical constants. Very detailed evaluations of the COSMO-RS flavors COSMO-SAC and COSMO-RS(Ol) have been presented by Mu, Rarey and Gmehling (see literature below).